This little penguin finally learned how to use a straw. 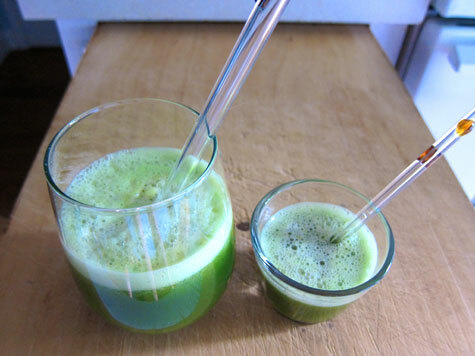 Green juice made easy! The return of WIAW, and another glimpse into our crunchy, crazy lives. But before I dive into the foodie-type stuffs . . .
Each week I play along with WIAW and I really enjoy it, and it seems like you all get a kick out of it too. But there’s always a few comments along the lines of “You eat so healthy, it kinda makes me feel guilty about what I eat.” And that makes me so sad! It’s a sentiment I can relate to – I think it’s human nature to compare ourselves to others. But as far as I’m concerned, I’m on the same food journey as you are, and we’re all doing this together. I’ve just been at it for a long time. I did not start eating this way overnight – you shouldn’t expect yourself to, either! I post my menus for two reasons. 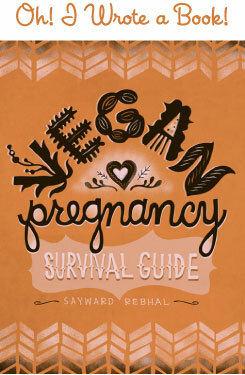 1, because I feel like there’s not a whole lot of resources out there regarding raising vegan children, and I want to help to demystify and normalize it. And 2, to inspire people by showing that healthy food is delicious and interesting and awesome. Because it is! Okay! Now on to the food. I had to give Damian a ride to work. 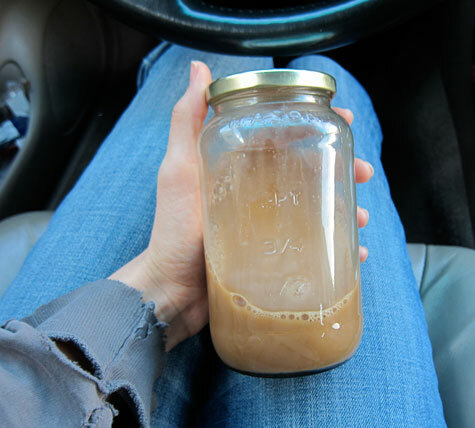 Java in a mason jar, on the go. Coffee (not raw) + almond/pumpkin/sesame milk (raw) + NuNaturals Vanilla Stevia drops (not raw). When we got home I did a quick workout, and then it was time to feed Mr Man. 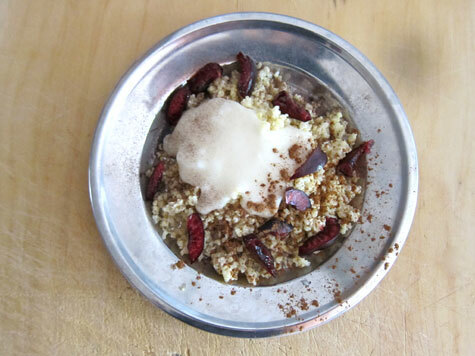 He had leftover millet with cinnamon and dulse, topped with melted coconut butter and cherries. There was a very scary cherry choking incident at the beginning of breakfast. Chop those cherries good, mamas! Mmmm, green monster. This puppy was super thick and I served it up in a soup mug, topped with Waits’ leftover cherries. It had: homemade kombucha (raw), hemp protein powder (raw), Vitamineral Earth (raw), vitamin K2 (not raw), pinch of powdered stevia (not raw), Irish moss (raw), a ton of FarMar kale (raw) and a handful of frozen blueberries (raw). Waits helped me drink this, of course. Lookit all that kale! Get thee into mah belly! 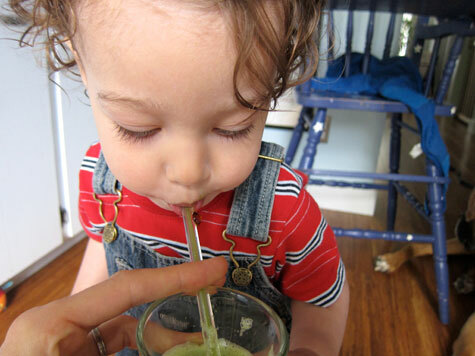 After our bath and Waits’ nap, I made us each a fresh glass of green goodness. This was a simple blend of kale stems, cucumber, some leftover cilantro, and a squeeze of lemon on top. All raw of course. With all the book-writing madness, I’d put my juicer on hiatus. I’m so glad to be getting back into it! Waits was pretty stoked, too. There was also some mid-juice munching. Waits nommed on kale chips while playing “look at me I’m a tornado” in the living room, and I had some carrot sticks (raw) in a homemade peanut sauce (~50% raw). Crash wanted in on those. After juice clean-up, we took the spotted beggar out for a stroll. We always stop by the grocery store on the way home, and as usual, Waits wanted “nanna!”. I couldn’t say I blamed him. Nannas are pretty rad, dude. Back at home there were more kale chips for me and a good long nursing session for the little mister. 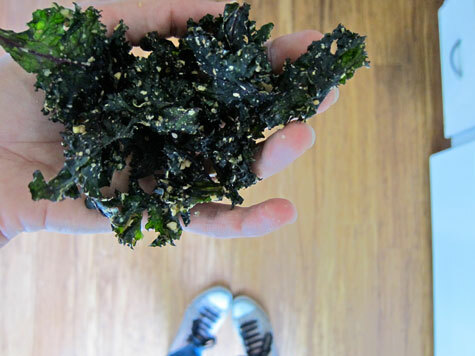 These kale chips included teeny tiny bits of cauliflower in the dressing, which added a wonderful texture. The dressing was tahini-based and included garlic scapes. All raw, totally delicious! In the afternoon we’ve been all about bike rides. It’s finally summer here and we have so. much. fun. tooling around town together. I do all my erranding by bike now (finally!) and Waits can’t get enough. Can you believe it had been almost two years since I’d ridden a bike??! On this particular day we rode over to the co-op, or I should say, the juice cart out front of the co-op. 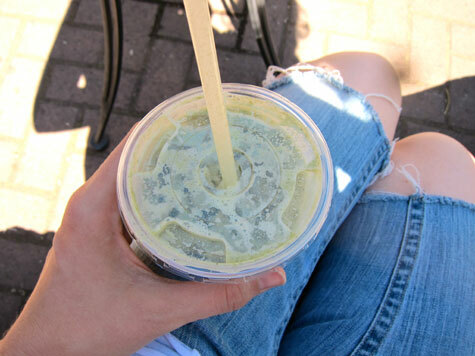 I treated myself to an iced matcha latte, because they make their own raw hemp milk every morning. Hello?! Heavenly. Date-sweetened hemp milk (raw) + matcha powder (not raw). And a homemade “energy nugget” (raw). This picture just doesn’t do my salad justice. 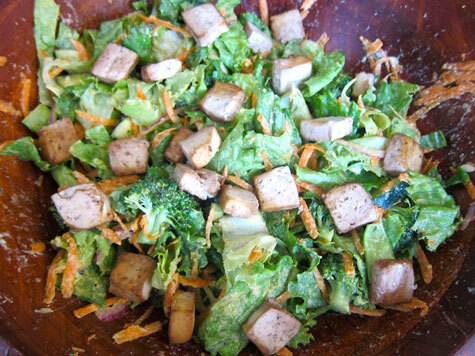 FarMar green leaf lettuce (raw), red onion (raw), carrots (raw), broccoli (raw), snow peas from my garden (raw), and baked tofu (not raw) all tossed in a raw tangy tahini dressing. This salad was sort of enormous. Waits had a hybrid of mine and Damian’s dinner: baked tofu, steamed carrots and broccoli and snow peas, and rice pilaf with tahini dressing. Raw broccoli seems to be a bit of a contentious topic among epicureans. I love the stuff but apparently most people don’t dig it so much. Which camp do you fall in? Raw broccoli: yay or nay? I really enjoy these very informative eating posts-great inspiration. 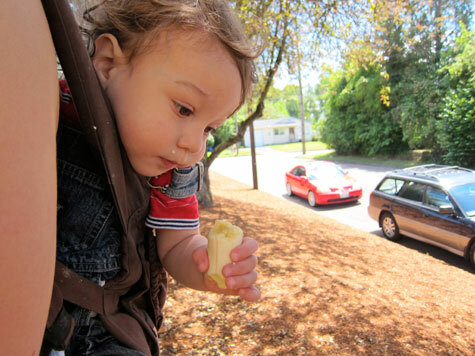 It is such a good idea to start one’s kids out with superfoods. You’re doing a fantastic job with young Waits! I wish we had started our kids out with fully vegan food. My youngest daughter is such a fussy eater-I despair-much patience is required…she will only eat raw carrot, raw peas, banana, raw oats with nothing added-granola with almond milk although she won’t drink the almond milk on its own, plain homemade yoghurt-(if I add fruit it’s a no go)and pasta with tomato sauce (home made of course)I can sneak like 4 lentils into the sauce before she notices….she loves fish which is the only source of protein I can get her to touch….I am reluctant to eliminate fish from her diet completely until she eats a good protein alternative…any ideas please? I am so against eating fish since I read the stats on fish stocks. I guess its patience patience on my part….at least the tiny variety she will eat is healthy….eight year old daughter is now having juiced apple with a teaspoon of kale-progress. Definitely yes to raw broccoli! It’s my mom’s favorite vegetable, so she definitely passed the addiction on. I didn’t know it was such a big discussion, I think it’s delicious! Yay to the raw broccoli – esp. dipped in hummus, yum!! Also, reading your blog doesn’t make me feel guilty, it’s something to aspire to. It also gives me hope about having a vegan pregnancy and raising a vegan child when everyone around me is emphatically telling me not to. I love ogling all the delicious food you make for you and Waits – I think it’s so fantastic your little one loves all this wonderful food. In fact, I often shove photos of your Baby sipping green smoothies under my Husbands nose as if to say ‘see, you can get kids to eat their greens and love ‘em’. Anyway, keep doing what you’re doing and I cannot wait for the book!!! I like how much green stuff you consume :D Salads, green smoothies and green juices ftw! I like seeing what you eat! I accept that it’s not a high enough priority for me right now to make the time and money sacrifices I would have to to eat as awesomely as your fam, but I AM always striving to eat more veggies and less processed, so anything that’s inspirational toward that end is fine by me! Also, raw broccoli all the way! I don’t even like every raw vegetable (carrots? so not into them, wish I was) but broccoli is probably my fave. And I agree with PeaSoup, looooove it with any kind of bean dip!! Oh and I love that you mentioned garlic scapes aka my new favorite garden edible. I love how healthy your son’s diet is and how you incorporate exercise into your day all day, every day. That’s a great example you’re setting for your son. Plus; he eats and drinks things that I’m betting 90% of adults in America wouldn’t touch because they are “too healthy tasting.” I love reading your blog! I like raw broccoli stems and stalks, but not so much the ‘flowers’ for some reason… However, I only cook them for like 2-3 minutes (steaming, usually) and then eat them cool, typically, like in salads etc so perhaps I should just get used to it? I love your WIAW posts! I like raw broccoli, but only if there is something to dip it in…otherwise it’s not a taste so much as a texture thing. 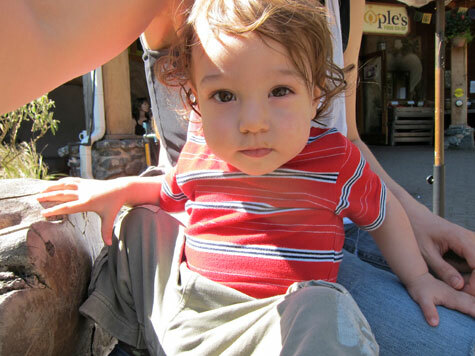 <3 <3 WIAW and triple heart that lil' monster of yours…can he get any cuter?!?! GAH! Raw green trees – YES PLEASE with lemon juice!!! I am fine with raw broccoli but I prefer to cut it smaller raw than I would steamed. I was rather shocked the time my daughters rummaged through the fridge for dessert, and came back one of them munching a red bell pepper (not so surprising – they do that a lot, but usually the other kid) and the other with a huge hunk of raw broccoli. It was pretty awesome! YAY! I can’t get enough broccoli! mmm raw broccoli! Good stuff! Raw broccoli dipped in raw ranch is wonderful! You are absolutely fabulous and inspiring!! 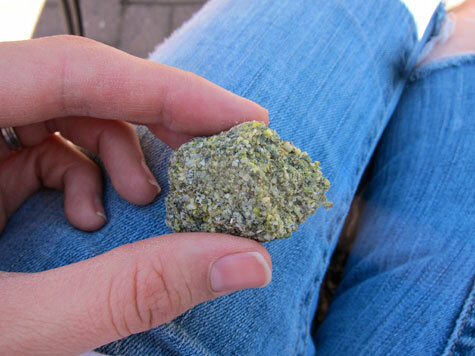 Do you know what was in your homemade energy nugget? Raw brocolli- nay for me mostly unless cut up real small…its a texture thing… but my husband and son can’t get enough…I love your WIAW posts partly because they are inspiring… partly because gorgeous healthy waits is such an amazing advertisement for eating well.. I don’t have a strong opinion about raw broccoli. Sure, why not?!? My husband only likes brussels sprouts raw. He’ll eat ‘em when I roast them with olive oil and garlic, but would rather have them raw! Everything looks so good! 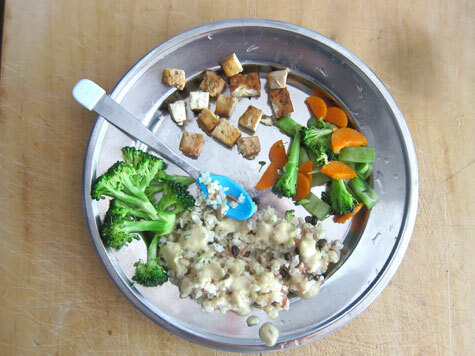 I would love to see some of the recipes you use like the tahini dressing, peanut sauce, and energy nuggets! Raw broccoli is one of my favorite veggies ever. I’ve been a broccoli fan since I was old enough to eat it! Everything you guys eat looks amazingly delicious. And really makes me want to try my hand at some green-filled smoothies! YAY for Peoples! I miss being close to it (would walk there daily when I worked on Hawthorne…) and I especially miss the cart – the pb smoothie, YUM. and YAY for summer finally being here, we are enjoying too! We love raw broccoli around here. The kids dig it chopped fine and tossed with plain yogurt and raisins. I love raw broccoli but it makes my stomach bloat up like crazy and then I get a stomachache!! So I try to stick to eating it roasted, which is my favorite way to eat most veggies. I absolutely CANNOT do raw broccoli! Never have been able to…I like all other veggies raw, but my broccoli has to be at least somewhat cooked. I love the WIAW posts- they are inspiring and I get ideas from them to help me figure out what to feed myself and my picky newly-vegan daughter. I also have an eight month old that should be eating solids pretty soon. Also, how cute are all of the pictures of your baby with assorted foods smeared all over his face/hair/the dogs/the floor?!? I can’t digest some raw veggies very well if at all. My gut protests big time and broccoli is one them. Oh well, steaming seems to help. I totally appreciate your WIAW posts and would miss them if you stopped. I just accept that I am doing my best with my kids and myself on our dietary journey right now–even though it is not exactly as I would like it to be. I love incorporating your ideas for the babes’ meals. I wish my day care lady were on board. She seems to really enjoy feeding my kids cakes and brownies! Love the pics of Waits with the straw. 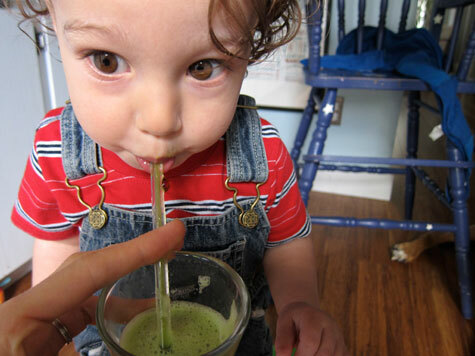 Harper has also recently learned and loves to help drink my green smoothies. I am happy to announce that I can usually get 5 out of 6 household members to enjoy raw broccoli :) YUM! So many healthy eats! I think it’s great to start little ones off with healthy food! I’m sure that’ll be great for the long term as well :) Looks like you guys are having a really fun summer! I love raw broccoli! As long as there’s something wet to dip it in. Like hummus, or another beany dip. 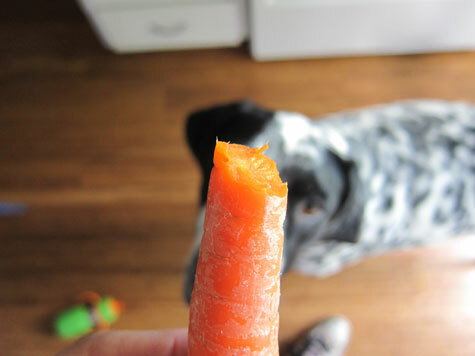 I’d prefer almost all veggies raw when eaten this way. Also: Waits is so handsome. His eye color is striking. Kinda looks like a greenish/orangey/brown. I see those comments everyso often too.. I added a lil somethin somethin’ to my WIAW page to address it even. We’re all about celebrating food here! 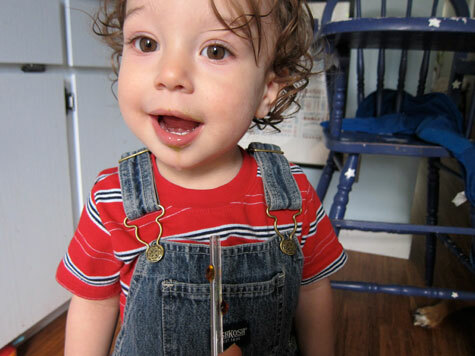 and I love the positive example you set and the invaluable resource you’re providing fellow mommies and prospective mommies about raising vegan kiddos.. and not jsut vegan kids – healthy happy kids! I heart it! esp as a prospective mommy ;) thanks love! I’m definitely a fan of raw broccoli, especially now that I’m pregnant and cooked veggies are making me gag. It’s all about the crunch at the mo’. Yom! That salad looks AMAzING. Well I am having to cook for 6 adults in my Ma’s house these days (when I’m not feeling too pregnant & too tired) and yesterday introduced a new Vegan (but not raw) ‘entree’ to the hungry tribe – I made some delicious spiced swede patties (made from the extra swedes my brother got from his picking-job) and everyone loved them! My Dad wants me to make a whole bunch and freeze them. Especially good with some sweet chili or something. Kind of proud. I love veges! i really want to try high raw for two weeks, so this post was especially helpful to me. i like broccoli any which way! Yes to raw broccoli… I like to chop it up very finely, pour over some lemon juice and olive oil and let it sit a while. Add some cumin seeds and you’re away. I’ve recently dug out my juicer too… we’ve been away camping for a few months so I haven’t had appliances. I did buy the occasional freshly squeezed juice but they are so expensive here! I’m loving it but I find I have to water juices down a little for the kids otherwise the flavour overwhelms them. I love raw broccoli. In fact, as a youngin, that’s the only way I would eat it. Even now, I only like it mildly cooked and still crunchy. What’s your workout routine like? I mostly walk and do aerobics DVDs (how 80′s of me) but am looking for a revamp. I’m not crazy about running but am thinking I should give it a go so I can combine the dog’s exercise with mine and save time. OK, I gotta say…. not so keen on raw broccoli, unless it’s juiced. I need a quick saute or steam! Your Wed. posts are so inspiring! Today I had a green smoothie, green juice, and a HUGE romaine/avacado/kale/carrot salad. I swear, these 3 things + good sleep + exercise make even the worst days mostly… pretty damn awesome. “look at me I’m a tornado” sounds like the best game ever – I may have to try it some time. Also; broccoli is good cooked or raw, as long as you pretend that it’s a tree and you’re a dinosaur. Oh my gosh. That first pic of Waits drinking from a straw is sooo adorable. Thank you so much for your awesome blog. You inspire me to be a better mommy! 100x YAY. Broccoli and if I may say cauliflower are two veggies that are so much better in taste and texture uncooked. @ zerowastelifestyle – Aw man, it’s so tough with picky eaters. You have my sympathy mama! For protein, would she do quinoa, maybe prepared plain as a porridge? What about hemp seeds? Have you tried other legumes, like mashed chickpeas or kidney beans or even organic tofu/edamame? What about homemade seitan (vital wheat gluten)? And buckwheat, either cooked or raw, is one of my very favorite sources of complete plant-based protein! Hope those ideas help some! @ Lacey – Oh goodness, I love it roasted into oblivion as well! 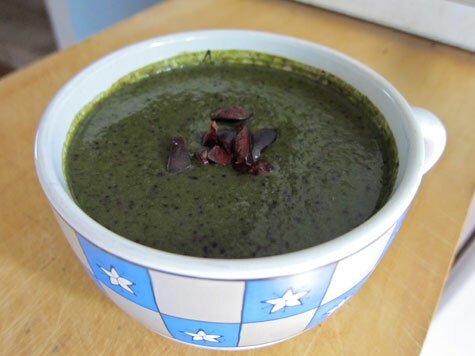 @ Shelby – I can’t give the specific recipe since it’s from my book, but it has buckwheat, pistachios, coconut, dates, carob, spirulina, agave . . . I think that’s it. So good! @ Jessica – A lot of my recipes I don’t measure. I’m sort of a “this n that” cook when left to my own devices. BUT, I get a lot of requests so I’m going to try to start including a recipe in my WIAW posts. Maybe not every single time, but I’ll try! @ Kristina – The chocolate peanut butter shake from Sip is seriously to-die-for. So indulgent! Man I haven’t had one in a *long* time, hmm . . .
@ Kat & Carey & Tense Rae- A lot of people have that issue with crucifers! Bummer, but you are not alone. @ Joselle – Sounds like we’re on the same plan, haha. I walk a ton (twice a day for 1/2 hour each at least, and at a very quick clip. I also do a workout DVD almost every day (10 minutes cardio, 10 minutes standing ab work), plus lately I’ve been riding the bike. basically I just try to be active all the time! I’m way too cheap to join a gym. But I really want to take up running . . . hopefully soon! oh yum yum, momma! This is how we like to eat as well. 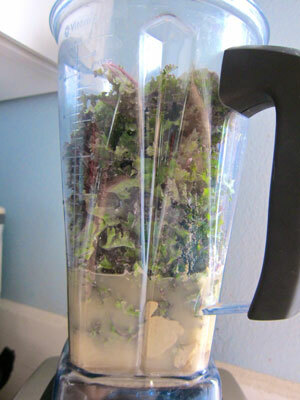 I just bought a vitamix in the beginning of summer and I am totally and utterly in love. It has changed our lives. I have lost about 15 pounds since then. I make all healthy smoothies w/ amazing meal protein powder (from Whole Foods) fresh fruit and veggies. I rarely add a sweetener, but if I do it usually agave. We make smoothies, juice, sauces and sorbets and ice creams. And, it’s all healthy. I’m crazy about it!